One of the things I’ve always admired in people of my grandparents’ generation is the vast variety of skills they have. Fifty, sixty, seventy years ago, people knew how to do things for themselves. Carpentry, canning, sewing, farming… These people were resourceful and knowledgable. And I think it is really sad that we are losing these skills to an age of convenience. My first two canning projects were tomato sauce and dill pickles, and today I’m going to share with you my recipe for the pickles. My husband Erick has already scarfed down two full jars (in two sittings, I might add), so they definitely have the stamp of approval! Oven mits – preferably silicone because they are waterproof! Wash cucumbers with hot water and soap. Rinse thoroughly to remove soap. In a pot, bring to a boil all ingredients except cucumbers, dill, pickling spice, and garlic. Once boiled, remove from heat. Wash jars, lids, and rings with hot water and dish soap. Sterilize jars in large pot of boiling water. Sterilize lids and rings in a separate, smaller pot. Remove jars from water and set on rack or tray. Fill jars: First, put in a layer of dill and a garlic clove at the bottom; then, tightly add cucumbers to the neck of the jar; add another sprig of dill and a garlic clove to the top; add about 1 tbsp picking spice to jar; fill with brine, leaving 1/2-inch head-space at the neck. Remove lid and ring with tongs and place on top of jar. Tighten ring, but not completely. Remove jars from water and place on tray or rack. When the lids “pop” they are sealed and the rings may be tightened fully. I actually made a mistake and processed my pickles too long. As a result, they weren’t as crunchy as I’d have liked. (Erick still loved ’em.) I’ve indicated the correct time (15 minutes) in the directions, though! As with all home canning, proper food preparation and safety needs to be observed. It is always best to do your research thoroughly before starting a canning project. Friends and family with experience are a great source of information, and many official websites for jar companies such as Ball’s and Mason contain useful information that will keep you and your family safe. So what are your tried-and-true canning recipes? Do you make a certain recipe every year or do you like to mix things up? Leave your tips or favourites in the comments… Maybe I’ll try out your recipe! I’ll have my tomato sauce recipe coming your way next week, along with some decor updates. Have a fabulous week! I have canned for years, but this is the first year I have tried pickles. I am now hooked! 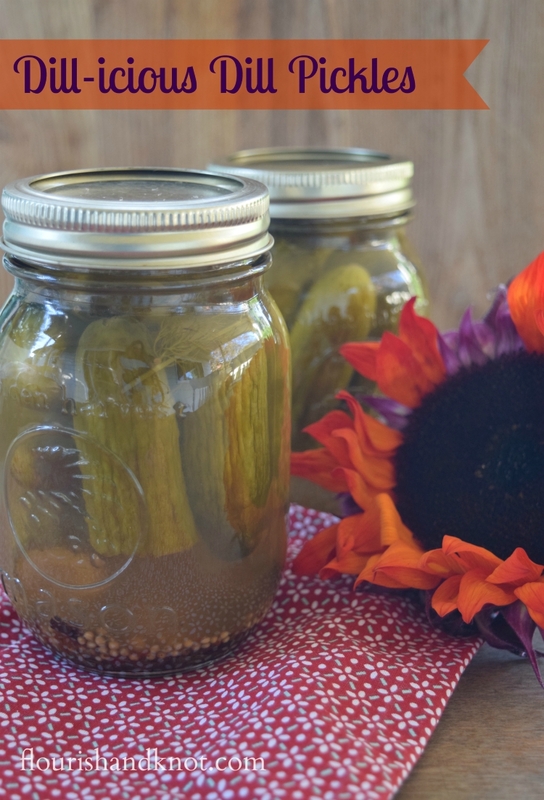 I didn’t make Dill Pickles yet, but I will have to give your recipe a try. Give it a try! I love dill pickles but now I want to try making my mom’s bread and butter ones, too. I haven’t made dill pickles in years – since we lived on the farm. I still can remember the crisp taste as you bite off a piece of that delicious canned delight. 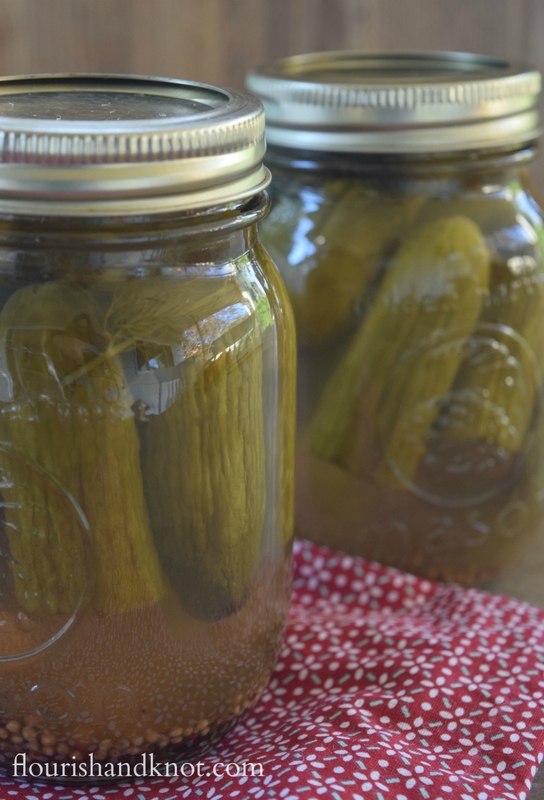 Thanks for sharing – my pickle canning urge is working today. LOL !!! I hope you get a chance to make some this weekend!